You must have seen these beautiful yarn globes before—usually hung as lampshades—and wondered how they’re made. I’ve always marveled at these beautiful globes, and thankfully, I found this tutorial so that I can save some bucks and make it myself instead of buying from a store. The method is actually very simple and clever – you use the same basic principles as we did for the cotton thread snowman, except you use a ball instead of a balloon. You can use this same balloon idea to make a cute button bowl, too. 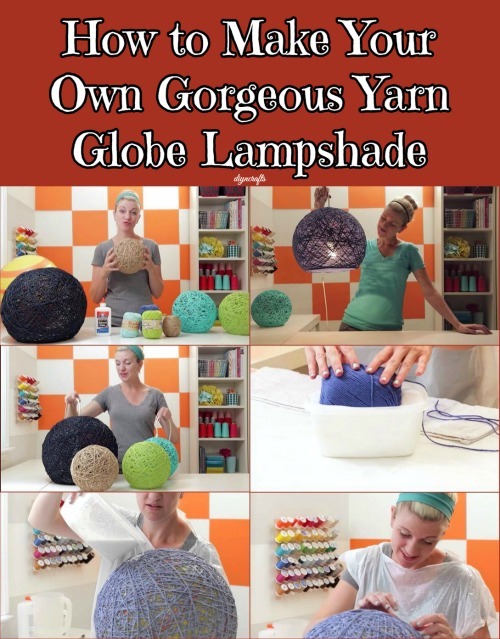 This specific tutorial is for a lampshade, but you can make full globes to hang or rest somewhere purely for decorative purposes. Tutorial by MADE Everyday Youtube channel. For more creative tutorials check out her weblog Danamadeit.com. First and foremost, you need to prep your area – this is quite a messy process so you’ll want to line your work surface with trash bags. If you’re clumsy or accident-prone like I am then you can make yourself a trash bag smock too. If you’re making a nice big lampshade, there are two things that you need to bear in mind: you need a large opening at the bottom so that you can get your hand in to screw the light bulb, and you need a small opening at the top for the cord to fit through. To make this easier for yourself, draw a guide line across the bottom of the ball, and a small circle on the top of the ball. Since you’ll be deflating the ball later, try to keep that hole at the bottom so that it’s easy to find. You aren’t using the glue as is, you need to make a mixture of equal parts glue to water. Just get yourself a nice big tub and then mix it all together. Next, take the whole ball of yarn and dunk it in the glue mixture – turn it around a bit to make sure that everything gets covered. Now for the fun part. Simply take the strand of yarn and start wrapping it around the ball – go in different directions, and make sure to keep the two holes unwrapped. Once you reach the end of the yarn, just tuck that last piece in somewhere. You can take the rest of the glue and pour it all over the ball for some extra firmness. Now you can balance the unwrapped part on a bowl, and then leave it there to dry – this will take two full days. Finally, it’s time to deflate the ball! If you don’t really care about reusing it, you can simply cut a hole with scissors, otherwise, if you want to make a few more of these, deflate it properly. You’ll see that you can just pull it right out when deflated. Now for the lamp part. Slide your washer through the cord and place it in the right position above the fixture, and then screw the connector in place above it so that cord can’t move. Slip that through the top hole of the globe and then screw in your light bulb – an LED bulb is the best option because it won’t burn the globe. Then you just need to plug it in and hang it where you want it! The shadows that it casts on the walls looks absolutely amazing.